My grandparents, Jonty and Meggie Webb (née Henderson), travelled to Canada in 1949 to visit their daughter Mary who had married Canadian Jimmy Ash and moved to Toronto. A newly found Henderson-cousin, Jayne Handyside of Amble, has found this historical gem while rifling through her family’s old photo box. 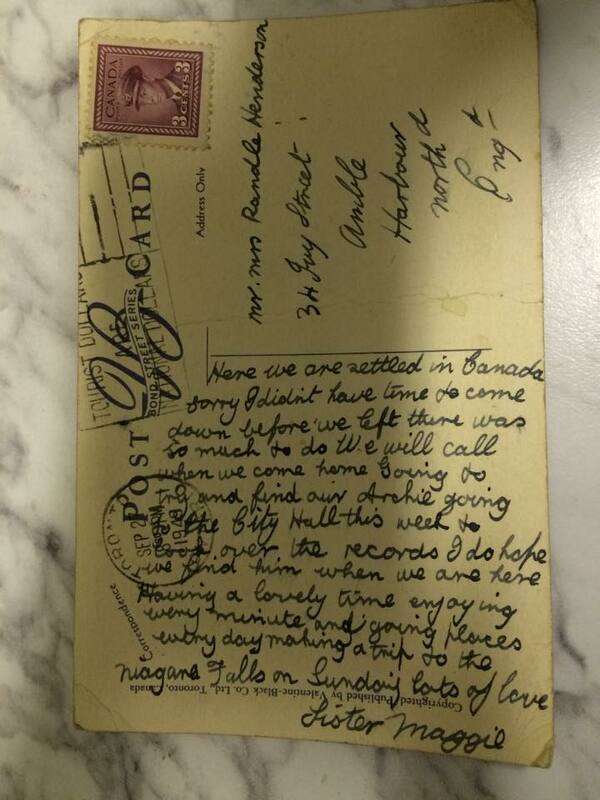 It is written by my granny and addressed to her brother Randle who was Jayne’s great grandfather. The Archie that is referred to in the postcard is younger brother to Meggie and Randle. He was born in Amble, Northumberland in1907 and emigrated to Canada. They are clearly having a whale of a time and planning a trip to Niagara Falls, which must have been quite spectacular for them on their first trip abroad. 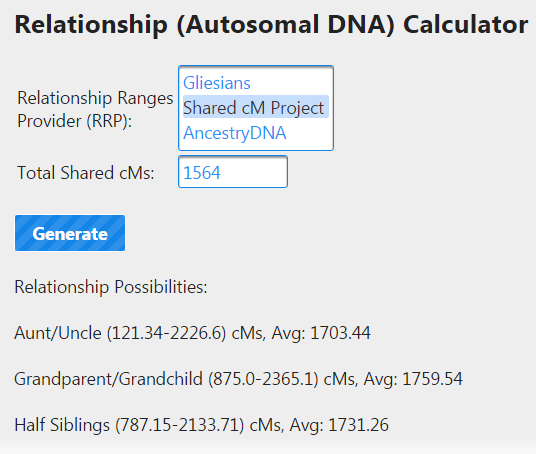 One of my distant genetic cousins is developing an autosomal DNA relationship calculator. This is a work-in-progress at the moment, so he is happy to have folks test and offer suggestions on improvements. You can find more information about his development activities on Robert James Liguori’s Blog. Beta-testing of the basic functionality is now started and he is adding more Relationship Range Providers so that we can calculate with various theoretical assumptions as the basis. Robert and I have a genetic relationship proven by DNA testing, but have yet to find the paper trail that will point us to our common ancestors. We know that they are on our respective maternal sides as we have an autosomal match between his mother and my maternal aunt. I rather suspect that these distant grandparents are lurking behind brick walls due to illegitimacy on both of our relevant ancestral lines. Best guess so far is that our ancestral paths crossed somewhere in Durham, Yorkshire or Lancashire. Possible names under investigation so far: Whitehead, Horsfield, Bailey, Shepherd, Mitchell, Manners, Webb. For more information on this intriguing conundrum take a look at my Brick Wall page.